In Dec 2010 Mike Dubber mailed to me a graver point that he uses and has been grinding by hand called a "Speitzer" point. He was thinking about how a template could be made for it to help shape and sharpen it. So over the past two years we have tried numerous ideas for a templates for it. This new template set is the result. Here is a photo from Mike of two different grinds showing how much the geometrics of the point can be adjusted manually using the template set. Wow what great news,look very interesting! I don't know if i'm right but seem like an Hybrid a 90v/120v in the same Chisel. i'm wait news about it , congratulations Mike and Steve to add this new point to the templates System! The plot thickens, a great mystery begins, what magic do such contraptions possess and to what purpose does the conjurer put to it? Is it for truth and good or does it find its heart in darkness placing round heels on pointed wand as if it were not sacrilege. Has the good Steve Lindsay fallen under the dark spell? Shall we wait for word or charge forth lance ready and pointed thusly with faith only to guide us? I've drafted a brief summary of the history and use of the Speitzer from my perspective. The story of the Speitzer Graver represents a brief study of FEGA history. It was first introduced to the members of FEGA at the 1987 Show in Las Vegas, Nevada at the very first FEGA Seminar, presented by Frank Hendricks. Frank – also our first FEGA President - brought nearly his entire engraving studio from Dripping Springs, Texas to Las Vegas in his horse trailer to present the Seminar. Among the many engraving revelations he presented to the group that weekend was the idea of the “Speitzer Graver.” The Speitzer, according to Frank, was the preferred graver of the Germans. It was easy to make, easy to sharpen, and it was a workhorse of the German engravers…where Frank had learned to engrave. The idea stuck with me, and spent the next ten years or so with my hammer and chisel and a stack of Speitzers of various shapes and sizes. I still use them today, but now I drive them with air gravers, and they still work just the way Frank explained. I recently discovered that I was using the Speitzer less and less, preferring instead to use the more contemporary 120’s and 90’s of Uniform Parallel geometry – mostly because I had this quick and easy way to make and sharpen them with a Lindsay Template. In the early days we ground a blank on our bench grinder and did the final shaping and re-sharpening with our oil stone. My efforts turned to creating a Lindsay Template for the Speitzer. Speitzer Geometry: the Speitzer would be recognized by most engravers as nothing more than an Onglette, but there are differences in the two just as there are major differences between the Germans and the French. If you analyze the shape and dynamics of the Speitzer Graver, you’ll quickly understand that the shape of the point is what makes it strong. Instead of a rather fragile “V” shaped point, the Speitzer has more mass at the tip, increasing in width and breadth from the tip through the body of the tool, affording it an increased level of resistance to breakage. The Contemporary Speitzer: After many years had passed, and with the advent of air gravers, Templates and Power Hones, I thought I was the only one who listened to Frank, and that I was the only one who used a Speitzer! My remorse was lifted when I enrolled in several of the the GRS Grand Masters Classes. These classes were designed for advanced engravers, and there was little time or need to discuss graver geometry. However, when I examined the gravers of the Masters like Winston Churchill, Phillip Grifnee’ and Alain Lovenberg, I found that most of their gravers were of various Speitzer Geometry – even if they didn’t call them Speitzers! I thought the mystery would not end with such haste. From drama to historical documentary, we didn't even have time to introduce a hero much less romantic entanglement. Still the magician with sleight of hand and mysterious incantation conceals what use the round template makes. I believe the graver finds its greatest use as a 'bright cut' or 'carving, shaping' type graver, it looks like it would leave a hollow much like Barry Lee Hands work here from the first post of his recent thread Carved Lee Helgeland Winchester Model 70 458 Magnum by Barry Lee Hands , is that its strong point? I am very interested in reproducing this type of work. When I examined the photo I thought he used a round much like what Les has presented and an onglette, the Speitzer are very much along the same lines as his wouldn't you say? I am however truly left in the dark with the round bottomed heel on a pointed graver, it has me baffled, will it round the point enough to make a round bottom? The Speitzer is just another instrument in the engraver's collection of creative tools. There are no great secrets and no great discoveries to make here. If you grind a Speitzer thin and narrow, it will cut hair lines, and if you grind it fat and wide it will cut deep and bright. If you make it pointed it will bring detail and shadow to life, and if you make the point rounded it will scoop out steel with a flair for the dramatic. If you lean it left as you cut it will create a left bright, but if you lean it right you'll see an opposing reflection....and when all these techniques are Masterfully combined you might even create something new that you can personally title. It might even be something to showcase here to dazzle all the other curious fellows seeking inspiration and support on these bright screens. 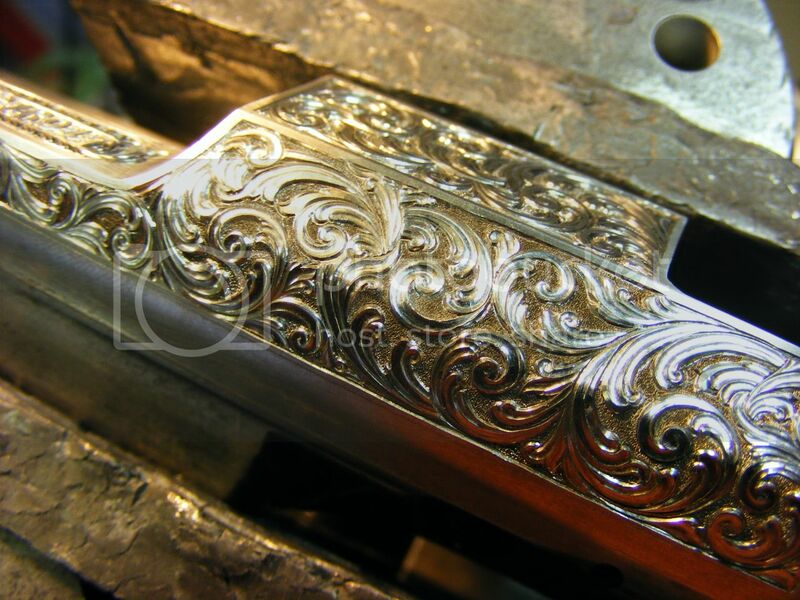 The answers are found in years of practice that virtually no other engraver or forum can give you. Those things are left to the individual to develop during the incalculable number of hours you must spend at the bench to wed skills and tools into art. I’m just passing a notion of graver geometry and history that transcends me, FEGA and Frank Hendricks. It’s geometry that works. We can whisk away valuable time being engravers or groupies, the difference might be in the base knowledge of the tools that we can learn about from others, and the wearisome hours we spend learning how those tools might be used creatively. I will take your word as to the 'Speitzer' if it was a secret or a great discovery. As I have not seen it directly and have no contact with any engraver outside Internet forums if such things are left unsaid they may well remain a 'secret' from me and waiting discovery. No doubt there are more ways to make the same round cut by any purpose made graver, it is the hand of the laborer and the willingness of the artist, but I have found there is often a 'right' tool for the job. I have spent my life with tools in my hand and eye and mind to the job, I have seen and I believe you as a teacher have noted, some learn by word or error, others with apparent blindness continually recycle the same mistakes. Such repetition is mostly unproductive, I find I am most productive with greater knowledge and less wasted motion, but that's me. Thank you for sharing your knowledge, as you have noted it's passing to others shows respect to its history. Congratulations on the launch of the Speitzer Template Set. The other day the shopsite was updated with the Speitzer Template set. I received my set today, thanks Steve. Thanks once again Mike for making it possible, I hope to practice with them soon. If the Speiter is anything like the onglette you'll be able to engrave anything,you can achieve beautiful detail if you decide to use it as a bruin when engraving birds and animals.I be ordering a set. J.J. So the speitzer is the preferred graver to engrave harder metals like gun parts? since the V point graver tends to break? Sorry if this is a stupid question. I only know 1 way of graver sharpening through using Ray Cover templates. In addition to being a very stong point for heavy cuts and hard metals, the Speitzer can be used for a wide range of light to heavy cutting - and, if I really want to cut a straight line, I always use my Speitzer ! I cut straight lines with a 90 degree square with a longer heel. What advantage does the speitzer lend to straight line cutting unless the heel is lengthened? I don't know for sure but I cannot imagine Master Dubber needing to use a long heel to cut a straight line, I believe he was stating the point provided excellent control. The principal of a longer heel used to cut straight lines has been in use for a couple of centuries, perhaps more. We all know that a short heel cuts curving lines best. A long heel tends to drag in a curving cut, but will steady the tool for a long straight cut. Thats fact, not theory. So, my question is what does a Speitzer do that makes it ideal for cutting straight lines that a longer heeled square tool doesn't??? maybe the difference can be that you are talking about heels in a V point and the Speitzer point in not a common V point but something like a onglette point? Yes, finding out a long heel will cut very straight is an early discovery for many. I don't think it would matter much what point you would use for such a 'trick' the heel will hold the point firmly inline, I just don't think Mike is suggesting doing so. I do not understand what you mean by 'ideal for cutting straight lines' Mike did not say this, he has indicated the point is very controllable and versatile and he uses it to cut straight lines. He has said the point can be ground to match the job, there may be a long heel or other grind to help with just straight lines I just don't see the need, if you have control and a line to follow why would you bother? Do you cut a great deal of long straight lines in your work? Hey Mrthe, I've used Phil Coggan's point, he does not use a heel on it. I found it will perform any task but requires much more attention and the point must be 'set' to start, no slipping in with the heel, heels make many things easier but are not absolutely necessary, as Phil proves very well. The Phil Coggan point is super,you have to get used to the cutting angle for cutting different types of lines ,outlines,shading,etc. Then you dont need changing graver points. With no heels just touch up the graver face. Bob,I have both the Coggan and Cortini templates I use them to create a dot and an onglette for lines when engraving birds,animals,scenery and skys,with out a heel your not going to get your graver to move through the metal. J.J. I don't know what you mean J.J.? are you saying that Phil Coggan's point is only for 'bulino' point work? I think you should give it a try, the graver is well behaved and will respond to 'normal' engraving techniques nicely. I prefer to use heels, it's easer but line engraving is not dependent upon them, at least not for me. Bob,I removed my Coggan bolino graver from the pin vice and put it in my Palm Control and cut some scroll back bone,you made a believer out me Bob it cut very nice.Still like the way it produces a dot. J.J.
Take a quick read on Phils and Steve Ls comments.It explains how the point works. I've just tried the point, I cut the heels a little long with a 2000 grit stone and left it unpolished. The graver handled with excellent control making tight turns and straight lines perfectly, cuts tiny circles cleanly. Using the graver with the PC is effortless, it cuts leaning way over or diving deeply and out again without complaint. It left a bright cut behind with a lot of sparkle in the cuts. I think I'll get a great deal of use from this template. A heel is not absolutely necessary, fine work to deep carving can be done without one, but having said that, a heel will get you some nice flared cuts and smooth tight bends, I have to admit that from time to time I use Steve's Universal template. I find that for good straight lines my template is easier, as when using a heel, if you tip it the tool slightly when doing a straight line that line widens at that point, and it doesn't take much to do that. And a marvelous photo to boot, Phil!! 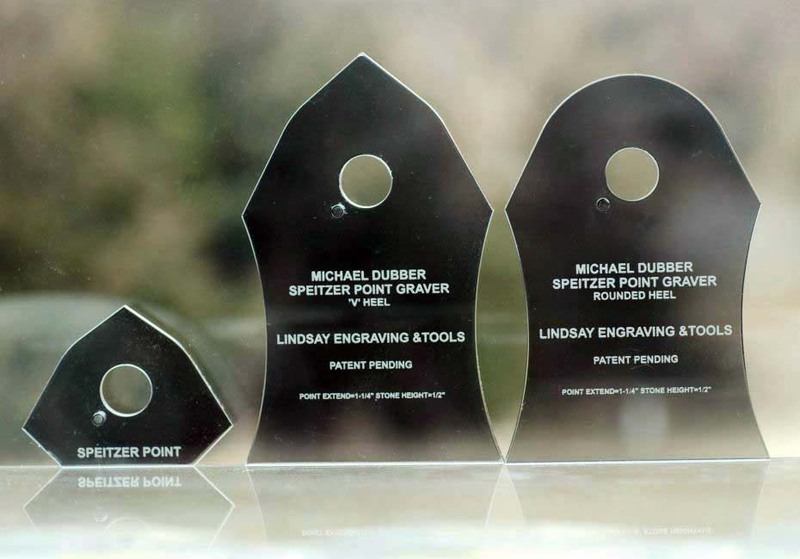 Thanks Phil for reminding everone about commissions - sharing graver geometry for these various Lindsay Templates is not-for-profit for the engravers who willingly share their ideas about gravers that work. And as for Steve Lindsay, he spends countless hours devloping the Templates that duplicate and reapeat the graver designs we send to him. The big winners in this process are the folks who collect and experiment with the resulting Templates. It's more about passing on all those little "secrets" of graver design we keep hearing about from time-to-time. The overriding point is that there really are no secrets and there are no absolutes. We will all surley have mixed success and failure when we try someone else's graver geometry. The fact is that a good measure of that success is found in the individual approach to engraving, and the skill of the user. I've discovered some really cool things about graver geometry by collecting these various "Signature" Templates from my contemporaries. My Lindsay Template collection is a virtual "rainbow" of graver geometry! Each one of these templates will create a graver that works - the rest is up to you. I am very grateful to all the Master Engravers who have given so much. To those who have included their graver geometry you are without doubt heroes to thinking beginners today and will be icons to future generations of engravers. I believe initially, other than impatience there is no greater obstacle to the beginner than graver sharpening and geometry, without which the novice will stumble and perhaps fall before knowing their potential. It would be best to find a instructor but most will not for many reasons, so your wisdom may well be the next best thing. For the sake of future engravers I hope Steve Lindsay can always obtain and maintain profit enough to continue the business into the far future, no greedy cooperation will maintain what Steve has both developed and brought together with the help of others. While there are other cooperate engraving equipment manufactures there is only one Steve Lindsay. Thank you Steve and all who support his efforts, bravo to you all. This photo shows a decorative brass award plate I engraved today. I used three different gravers, the Lindsay Universal, the Spietzer and a 1mm Wriggle. I think it's obvious that the bright cuts in the scrolls and initials were made with the Universal, but most of the single line work within the scrolls and all the letter outlines were cut with the Speitzer. Boy, I would love to see a high resolution photo of this engraving plate to examine and study it - and I would guess that other people would also. If you could email me a high res photo, I could post it on EngravingTransfers.com in the high resolution form and then post a pointer to where it can be found. Les.I now have your gold inlay & undercut template and waiting for a roll of dead soft copper from Rio Grande to give it the test,the Speitzer will be next. J.J. Please let me know how it works for you. I spent a lot of time trying to make this graver effective and easy to make and I am really interested in feedback from other Engravers. I love your abundantly expressive work, it just explodes! I need some more lessons from you I think... design work maybe. I saw Mike's work-in-progress prototype template at his shop almost 2 years ago, and of course I had to go home and make modifications to one of my template sets to approximate what he was doing with his. Now I can get the real thing. I have made a number of gravers with my modified template and found them to be very useful. I also made some very tiny gravers by soldering dental burrs into square brass tubing purchased at a hobby shop that Mike drove me to. Thanks to John Barraclough for that idea. I have used them, along with my Coggan points, for bulino, either with a heel or without a heel, as the material required. The generous sharing of information among engravers today, especially by masters like Mike and Phil and Steve, is driving an explosion of recognition of the art worldwide. I saw the post and liked what I saw. At the time I didn't really understand what the 3rd template would be used for but I ordered the set and thought I would understand what the Rounded Heel template was for once I received the set and sharpened a couple of gravers. I didn't want to be the dummy and have to ask just what it was to be used for but since I haven't seen anyone else ask the question in any of the other post I have to ask. Could you please explain to me just what the Rounded Heel template is to be use for? Hey thanks for the reply and inforemation. It didnt make any since looking at it but i tried shaping a graver with the small template like i would with the other template set i have gotten from Steve then used the rounded big template to put a heel on the graver and experimented with the amount of heel and really like the results. Seems that it gave me a lot more contr with the round heel. It is much easier to change direction verses the square heel. Im glad I spent the money just to get the round heel on a pointed graver. That is something that i had never though of trying but it does. I really like this geometry. If you don't already have this template, give it a try. Going to ask my question that I have about the Spreitzer Point. I have read this thread three times and still have the same dumb question. Made my first point today with the flat heels. It cuts very deep and straight as heck. Nice. I have not tried the rounded heels yet...but is this point just for straight cuts? Mine doesn't like curves and leaves a mess on the outside edge of the cut. It leaves no mess at all when used in a straight cut...but curves are not neat at all. Is this going to change once I make a point with a curved heel, or does the point really only cut straight lines? If it is supposed to cut nice curves too, can someone point me to a good tutorial with either a good written explanation or maybe even pictures, to show me how, actually to make this point properly? I made it the same way as all Lindsay Templates are made, little, then big template...where am I wrong? Or am I wrong? Your question is difficult to respond to as it appears you lack basic understanding of the purpose of heels. Having over 300 posts this seems odd, but I am well acquainted with the idea that how much you speak does not necessarily dictate the level of your experience. The simple answer is your heels are too long or your cutting at too low an angle if your dragging the edges on curves. The relief and heel grind is to allow greater lift and clearance for the graver to miss the edges of the engraving when turning the graver. If you cut the heels too long they provide a 'plane' for the heel to follow, this longer heel will defeat the true purpose of the heel. Your statement about how well the point cuts straight lines indicate your heels are far too long to cut curves. You may know that too short of a heel will offer less metal at the point and make breaking much easier so it is a balance of need and operator control, not something anyone can tell you as it will change with your need. I believe the experts do not want to stifle anyone from experimenting and finding what works for them, so they offer only basic advice on heels. If your heels are 'normal' it may be your technique, do you plunge your graver in at a greater angle to start your cut? If so you may be cutting at too low an angle and causing your problem (this will also make you push down harder to hold it in the cut). If you start this way try to start the cut at your cutting angle and see if your graver bites into the metal or if the back of the heel is plowing in before the point, your cutting angle should be close to the angle where the 'flat' of the heel at the point is parallel to the work. Unless you are cutting very deep, cutting at this angle should offer all the clearance you need to not dig up the edge. Why not start a thread and show the point you are attempting to use and its result, perhaps those with greater knowledge will offer to help. RedGreen gave an excellent reply to your question - I'm not sure that I could add anything that would explain it any clearer. And after I had a moment to think about your painfully blunt statement...you might be a bit too correct. I should know about heels, true. I'm trying... it is 300 Posts of questions, if you bother to check. And... if I can cut a line at all, it is due to the kindness of those on this forum for having the patience to answer my dumb questions. So, you say I might not understand the basics of heels. Could be. I've never had any instruction. One of those things that happen when you live thousands of miles from most of those who teach and those that do indeed teach within distance...I just can't afford to ask to teach me. Any kind of instruction is out of my financial range. But... we still keep on plugging along anyway, cause it tickles my fancy and despite not being of the standard of some of those on the forum, the things I manage to make, still look good to me, give me a smile and please the recipient. But...we will accept your evaluation, as it seems to be accurate. I wish I had a better camera, as I would take a picture of the point. My 15 year old camera won't focus well enough. But the heels are not long. Just a band of maybe a hair width or less. My universal tip has more heel. Twice as much. So I "think" my heel is not too long. So this leaves the fact that I may be cutting with the graver too low. Could be. True, when I start a cut, I tend to tip the point up high to get into the metal so as to avoid the bottom of the graver making a long "V" shaped start before the start of the line, which is difficult to control and you have to start a bit away from the end of the line to avoid it. I back cut, but if I don't watch out, the beginning of the cut isn't where it should be. As you say, the back of the heel is plowing in before the point. And I do have to push down on the graver. True. Perhaps all of this could have been avoided by a bit of instruction or having started with normal hand pushed gravers rather than having started with a tiny wonder that will push the graver through the metal at all or any speed or angle you want to use. I do indeed cut a bit deep as cutting too lightly makes such thin lines that you end up re-cutting much of your work just so you can see what the picture is without the aid of a microscope. I want it visible. So I cut wide, and that translates to deep cutting unless you use a graver with a heck of an angle like a caligraphy point. Sorry, I did not mean to be blunt or unkind seems I've stepped on your toes all the way up to the heel, I meant I understood how and why you had the number of posts. As for not knowing all the answers, I believe most everyone here fits in that boat, I'm the old fool fishing with no hook in the back. So far I'm self taught also, or should I say I have had no 'paid' instruction, but have received a wealth of knowledge from the generosity of many others. If you don't ask and can't find the answers yourself you may never know, I think you did the smart thing, how many others want and need to ask but don't? It is sometimes just as hard to answer as to ask, and if you make mistakes and others don't correct them you may have diverted and misled someone, and it is easy to insult others unintentionally at times. I 'tested' the point when I first obtained it and it preformed every task asked of it, but I have not 'used' it for a project so I'm not well versed in its use, however I know it will perform as it should. I think I would learn to start the graver with less angle, and back cutting should be part of the plan, I believe most engravers do so. I think you will find it much easier all around. The universal should cut round dots and not dig into the edge. I think after you learn to cut at the proper angle your problem with 'light lines' will show improvement, you're not getting the best results or performance from your graver with your present technique. I would try to make your graver start at the proper cutting angle and it should just bite in with the point when it touches the work. Watch Steve's videos, there is much to glean from them, as you learn more you will 'see' more, so if you've seen them before, look again you may learn something new. Hand pushing feels like nothing else, it is a great pleasure with a sharp graver and a quality block, when all goes well. The loss of that 'feeling' for control is a small price to pay, if you think hand pushing will help I'd give it a try. I'd also try using Phil Coggan's 'Bulino Point' that he uses, it has no heel and cuts wonderfully, you just have to keep your mind on your cutting angle at all times, no heel to balance on makes it a little more important to do so, but it may help you get a feeling for it (or drive you crazy) as you cannot rock back on the heel and must maintain a proper angle. Circulation returned overnight to the toes...so lets forget about it. I just re-did the point very carefully and no matter if the heel is long or short, or at what angle I go at the metal, in a circle or curve, it still drags the bottom rib that the smaller template made. It is tempting to just go at that rib with a diamond file and round it off. So I better sleep on it, almost eleven here now. I do have one question, read the quote. What do you mean by less angle? Higher or lower with the graver? I am running with the graver up, as it cuts into the metal there, but with it down, it just glides on the bottom rib and doesn't actually cut. I can bring it down, but that means a thinner heel, or? And holding the graver up higher is due to the heel being longer...or? Clear me on this. But it still drags in the corners. Thanks! I think I should retest the point with this dragging problem in mind. Perhaps I'll take some pictures that may help. You seem to be trying everything and nothing is helping so maybe a closer look would be in order. What I meant by that statement was not to plunge the graver to start it, but start it and hold it at the same cutting angle. Whatever the problem is I'm sure it has a solution, hang in there. I'll try to do the retesting tonight and let you know what I found. Perhaps Steve or Mike will have better insight on this and will chime in. The "Rounded Bottom" Template makes the Speitzer Graver work...it creates lift and clearance - what we refer to as the Heel. The heel allows the graver to cut without digging deeper and deeper into the metal as the cut is made. It also helps prevent the occurrence of furrowing - just like the UPP Geometry does for the point gravers (Steve's Detail, Universal and Calligraphy Templates). The rounded template is used to create a very small, almost imperceptible, bright facet around the circumference of whatever Speitzer Graver geometry I am trying to create (from rounded to pointed). I use this Template without the power home. I simply roll it back and forth across a hard stone (like a Ruby Stone or Hard Arkansas) and then examine the point with a 10X loupe until I see that I have have formed a consistent bright heel at the point of the graver.